Here are our top 10 gluten-free breakfast foods that can provide a boost throughout the morning. All these products are convenient to grab and go and don’t take time to prepare. During a Gluten-Free Living Facebook Live event on February 1, the GFL team gave their first impressions of these hot new foods in the gluten-free breakfast world. Watch the video to hear the panel’s thoughts and check out the list of products mentioned and where to find them. Click here for our roundup of gluten-free foods from the last Facebook Live. These packs have peanut butter and jelly all in one pouch! Or, if you prefer, almond butter and raspberry spread. They are great to squeeze on crackers, fruit, toast or right into your mouth. The packs provide one fruit and one nut in a fast pack for pure, delicious energy. They’re all-natural and certified non-GMO, and come in Almond Butter and Raspberry Fruit Spread, Peanut Butter and Grape Jelly, Almond Butter and Strawberry Fruit Spread, and Peanut Butter and Blueberry Fruit Spread. Buy them here. These soft-baked breakfast ovals are made with all-natural ingredients and a great source of fiber and whole grains, making them a good choice for an on-the-go breakfast. They’re allergy friendly, Kosher, Halal, and made with all-natural ingredients. The ovals come in a variety of flavors, from Maple Fig to Berry Medley, and each bar has 220 calories. Buy them here. Bob’s Red Mill brings another whole grain, gluten-free product to the table. Each soft bar is made from simple, clean ingredients that provide lasting energy. They’re free from gluten, soy, dairy and egg and contain 7 grams of protein and 11 grams of sugar per bar. This is a great option for a transportable breakfast that can be thrown into a briefcase or backpack for energy. Buy them here. morning commutes or to stow in your desk at work. They’re just 90 to 110 calories per pouch and a good source of fiber, easy to digest, vegan, Kosher and non-GMO. They’re made with real fruit and whole grain oatmeal, plus they come in lots of flavors to choose from, including Maple Pear Quinoa and Peach Chia Vanilla. You can grab this oatmeal pouch and head out with no need for a spoon or hot water. Buy them here. These fruit and nut bars have only a few ingredients and are non-GMO, gluten free, vegan and dairy free. The original LARABAR now comes in two new flavors: Chocolate Hazelnut Swirl and Peanut Butter Banana. LARABAR now offers bars for kids as well, which are small and contain no high fructose corn syrup or artificial flavors. These bars are quite popular and the additional flavors and versions for kids will keep their followers happy. Buy them here. Ample V is a full meal in a bottle made from real-food ingredients and packed with healthy fats, complete protein, fiber, probiotics and organic greens. It comes in powder form, pre-portioned in a bottle, and you just add cold water or milk and mix it up. The texture is rich and creamy and taste is subtle and nutty. The shakes are plant-based and have 400 calories per serving. Buy them here. These reduced sugar fruits have no preservatives and are non-GMO. They can be eaten by the handful, on salad, over yogurt or mixed with nuts. This treat adds sweetness and texture to breakfast fiber and low sugar. 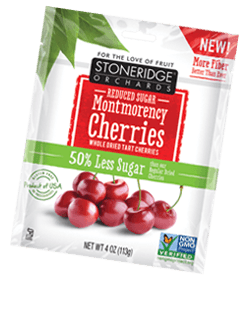 The newly-introduced line has 50 percent less sugar than Stoneridge Orchards’ regular dried cherries. Buy them here. they’re a good option for the whole family to enjoy in the morning. They contain the pediatrician-recommended daily value of Vitamin D3, promote strong bones and immune health and are gluten and soy free. The gummies taste good, too, with a tangy mandarin orange flavor and 1 gram of organic cane sugar each. As a bonus, the packaging of the vitamins is made from post-consumer recycled and recyclable bottles that are BPA free. Buy them here. These low-carb crackers are a good morning snack or a vehicle for cheese, guacamole, or peanut butter. They contain no lactose, soy, wheat or gluten. They are Keto friendly, contain 5 grams of protein per serving and have few, simple ingredients. Buy them here. morning, these steak bites are an easy option for plenty of protein on-the-go. They have 8 grams of protein per serving and are made with grass-fed beef with no antibiotics or growth stimulants. They are flavorful, with semisweet notes of cranberry and a mild kick of red pepper. Buy them here.